us to this point in the history of the family of Hope Home. We are renting a premises that is owned by a dear friend now back living in Australia and this house has previously been home to many orphaned children placed in her foster care until their adoption. It is wonderful to see this home once more be a shelter and place of growth and refuge for Thai children once more and a place where God’s love reigns. Sometimes God’s timing of events seems odd to us, but more and more I am learning to trust in His timing, and know that He is in control. Two years ago we needed to send one of our 10 year old boys away to a large institution in Bangkok. I and a mission colleague have regularly visited Phil there and been praying for a way to return Phil to his lifelong home and family. This has been a tough two years for us, and for Phil too, so it has been wonderful that last week the way opened and cleared for Becca and I to go to Bangkok and bring Phil back home. He is now under the direct foster care of Becca, and living next door to the new Hope Home, so we can all help in his upbringing and care. Phil is happy to be home, remembers us all, however he has lost a lot of weight, forgotten many of his previous skills but we can say with con dence that God is in this, and in His life, and that healing and restoration will surely come. CAM is undergoing a name change, which will be formalised next month at the CCT Assembly…..we are becoming CCT Ministry of Health Promotion, and will be linking up administratively and practically more with the Social Development Unit and with the Child protection unit of the CCT. Our name may change, but our mission and vision to reach out in love, acceptance and understanding to vulnerable people, especially those affected by HIV and AIDS, will not alter. The needs continue, and we as a ministry know our work as Servants of God is not yet done. The name change is because of the stigma still associated with the notion of AIDS, so for the sake of our clients we are trying to remove the source of further stigma if associated with CAM. Let me introduce one of our staff members, Mit, who has a huge heart for helping vulnerable people from the ethnic minority groups, primarily the Lahu people groups. He tirelessly seeks ways to help link them with sources of help, increasing their own sense of self-worth and self-independence, and increasing their knowledge of a God who truly cares for them and is concerned for them above all human compassion. Pray for him and his family, dedicating their lives to helping fellow Lahu people. Thank you for the support and encouragement of the ministries here in Thailand, through your prayers, letters and emails and through your financial giving. Your generosity through BMS reaches into the hearts and lives of many people here, and on their behalf, thank you. Please consider regular support of BMS through the 24:7 Partner Scheme. The details of this can be found on the BMS website. May God richly bless you in all that you are and do for Him wherever He has placed you, and I pray you know the peace and joy that comes from serving our Lord and Saviour. For protection over the Hope Home children, and for excellent health care facilities provided by the government. “It’s so exciting being a Home Mission church. We’re acutely aware of our restrictions and, frustratingly at times, lack of funds to grow God’s kingdom on Windhill in Mexborough. Yet the Great Commission is to the small and large church alike, the same commission whether we’re rich or poor, and to the best of our ability we connect with our community, businesses and organisations in the town. “This is the fourth year I’ve been asked to do this. I took one person from church with me to each of the services and it was great to be able to share the good news of Christmas with the patients and pray with those who asked for prayer. 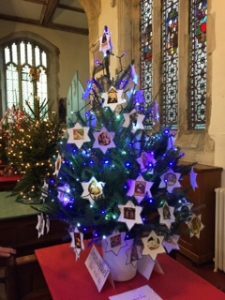 “For Advent Sunday the Scout leaders, with the help of 25 pieces of card and a washing line, took us through 25 aspects of Advent – the adventure of expectation looking forward to Christmas. 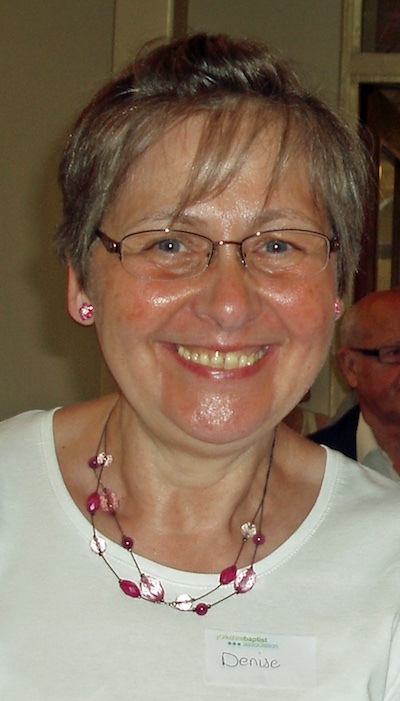 Some of the calendars were shared at another of the church’s ministries, continued Denise. “We had some calendars left, and took these to our monthly service at a supported housing complex and repeated the 25 days of Advent with the residents. After this we were all treated to fruit cake and cheese by one of our regular attenders. We’ve been leading the service for a couple of years now. It came about because one of our members is a resident there and can no longer come to church. We approached the housing complex to see if we could bring the service to him and any others who might be interested. “The small group of residents call it their church and it’s interesting how it’s developed. One regular attender made a wooden cross, others the communion tray – and others provide the tea, coffee and cake. They really own it, and one gentleman who, due to his condition hadn’t been to church for so long, looks forward to church every month. He felt alone and abandoned, hardly ever visited by those he thought were his friends. He meets with one of our team every week who has taken him on a journey of finding Christ for himself. “We have the church’s Christmas dinner at the same supported housing complex and this time 66 people attended – the largest proportion from the Royal British Legion (I was asked to lead the British Legion Remembrance service at the Mexborough War Memorial this year). There was also a group from our own Scout leaders, plus people from the supported housing and our own church people. It was a great afternoon with quizzes and carols after the dinner. “Avalunch – the community café which meets at the church – also had their Christmas dinner with about 80 customers, some of whom attended the Christmas Community Communion as well. Avalunch has recently started supplying lunches to a local day centre. And in 2016, Avabrecky was introduced and is running once a week to provide breakfast to the local community, anything from a slice of toast and a cup of tea to a full English! “At a recent Doncaster Council for Voluntary Services event, one of our long-standing volunteers, Peter Moore, was recognised and received the Senior Volunteer of the Year Award. We were all so excited by this that we presented the award to him again at the Sunday service! 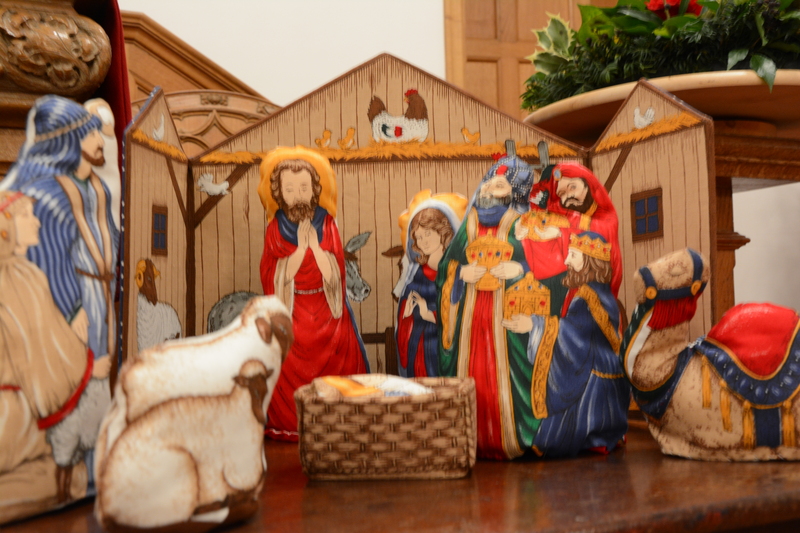 One of the many Nativities on display throughout Advent in the church. 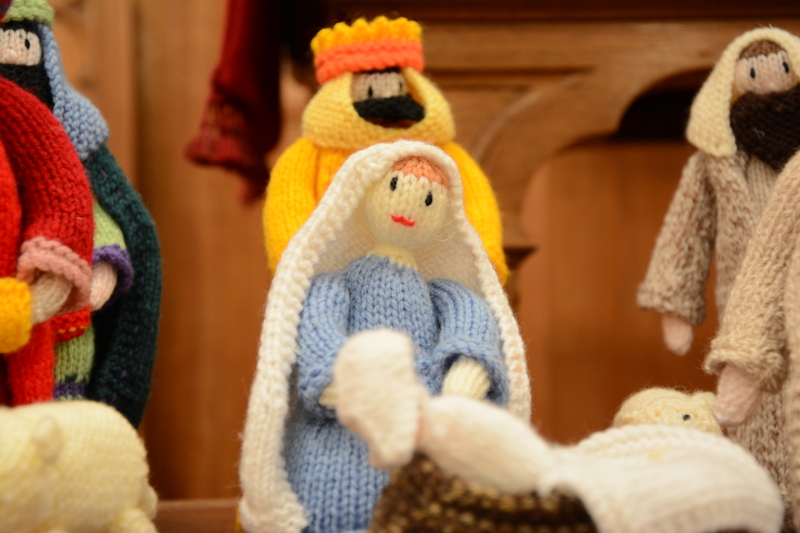 This knitted Nativity was a favourite with many. Christmas has been very busy in church this year; we have been involved in the Festive evening when we invited visitors to dress up and take part in the nativity scene, we hosted a concert by Fiona Firth, our Carol Service last Sunday was very original and well received and we took part in the Tree Festival at St Peter and Pauls.